ec-lec-tic adjective. 1. Selecting what is considered best from different systems or sources. 2. Composed of elements selected from diverse sources. noun. One favoring no particular belief or practice, as in philosophy or art, but selecting from all schools or methods. Marty Young's work in fiber is certainly eclectic, as she utilizes various techniques and fibers from all over the world - including those that are antique and vintage. Her interest in fiber began at an early age when she learned to sew doll clothes in addition to her own clothing. Marty grew up in a military family and had the opportunity to live in Japan and Hawaii during her childhood, later traveling to China and Tibet. These experiences exposed Marty to the beauty and quality of vintage and contemporary Asian textiles and led to her interest and appreciation of their colors, patterns, and design aesthetics. Marty says that "Quilt-making and fiber provide an ongoing satisfaction that grew out of my early childhood sewing experiences. They fulfill my need to use color and imagery and they provide an interesting format that allows for periods of contemplation." Marty's exhibit incorporates wall quilts and "wall dolls" (coined such for their ability to hang on the wall) - both which feature unusual and exotic fabric remnants. 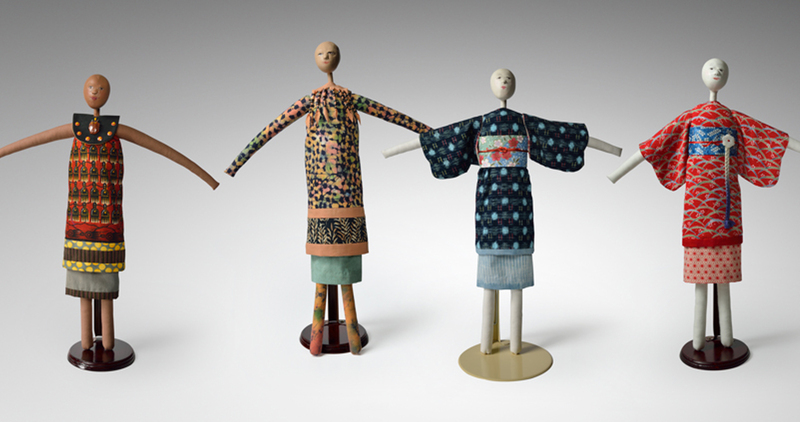 Marty purposely leaves the doll form simple to focus the viewer's attention on the beauty of the textiles chosen for the doll's dress. Her quilts tell stories, such as her "Seven Gods of Fortune" series, which use exotic fabrics and sewn-on additions to portray the personalities of the seven deities. The work presented in this exhibit encompasses many different techniques and formats, all bound together by one common, eclectic thread - fiber. On view November 21, 2018 - March 3, 2019.